Le Bal's latest exhibition, Foto/Gráfica: Une nouvelle histoire des livres de photographie latino-américains (A New History of Latin-American Photobooks) opened last week. The show is based on a selection of 40 books taken from Horacio Fernandez's recently published book on books, The Latin-American Photobook (Aperture, 2011). This is not Le Bal's first photobook exhibition—they presented Japanese Photobooks Now in the summer of 2011—but it is the first time that they have devoted their entire space to an exhibition of books. Following this show they will be hosting the 5th International Fotobook Festival, which is traditionally held in Kassel, so it seems that photobooks are becoming one of the major areas of focus of their programme. According to Martin Parr, Latin-American photobooks "are the best kept secret in the history of photography"... one of the many secrets that are being steadily revealed by Parr and/or Aperture through The Photobook: A History series, Japanese Photobooks of the 1960s and '70s and a forthcoming book on Chinese photobooks that Parr is doing with WassinkLundgren chez Aperture. The 'books on books' phenomenon is gaining so much traction that Andreas Schmidt, a pleasingly disruptive photobook maker, is already looking forward to the book on books on books which surely can't be too far away. As for Parr's quote, I am willing to take his word for it, knowing absolutely nothing about Latin-Amercian photobooks (with a few Mexican exceptions) and having had very few opportunities to see any. I was particularly interested to see how Le Bal would take on this subject. Although there appears to be a growing trend for exhibiting books, the ones I have seen so far have generally been disappointing. Books are not an easy thing to exhibit, in fact they are exhibition-resistant in my view. Most people's preferred position for reading or looking at books is sitting down and they are generally consumed by one person at a time, things that are difficult to replicate in an exhibition context. Exhibitions do not encourage visitors to touch the works on display, making it difficult to display more than one spread, something which is painfully reductive unless multiple copies of each book displayed can be tracked down. I think the key in exhibiting books is in overcoming these obstacles by recreating the immersive experience of a book in a way that goes beyond the experience of going into a very good bookstore. In addition to the basic difficulties of exhibiting books, Le Bal's space is far from huge whereas Latin America is on the large side and presumably has produced a decent number of interesting photobooks over the years. This poses the additional challenge of avoiding the exhibition equivalent of a 'best of' compilation album. To borrow the strapline from a random 'Best of Latin America' compilation, this could have been "a lively exhibition filled with hot and spicy Latin American photoboks!" which would probably have given me a severe case of indigestion. Thankfully the exhibition successfully avoids most of these pitfalls. 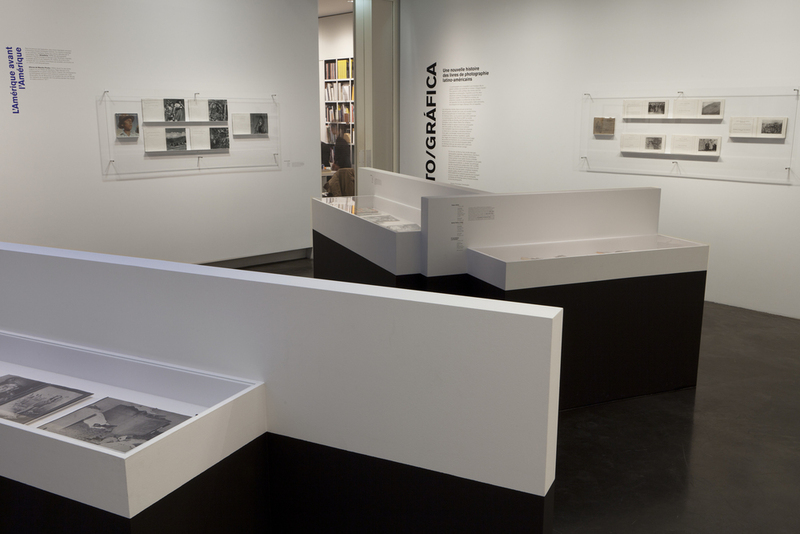 Rather than structuring the exhibition around individual countries, it is broken up into a series of sections: history and propaganda, urban photography, photographic essays, artist books, literature and photography, and contemporary books. These categories go beyond the traditional bounds of the photobook, expanding its definition to something like 'books that contain photography,' which makes the terrain far more diverse and interesting, bringing in books such as the revolutionary propaganda tome, Sartre Visite a Cuba (1960) or Auto-photos (1978) an artist book documenting a performance. There is enough material in each of the sections to whet the appetite, but without requiring you to spend several hours in the exhibition space just to cover all the material on display. 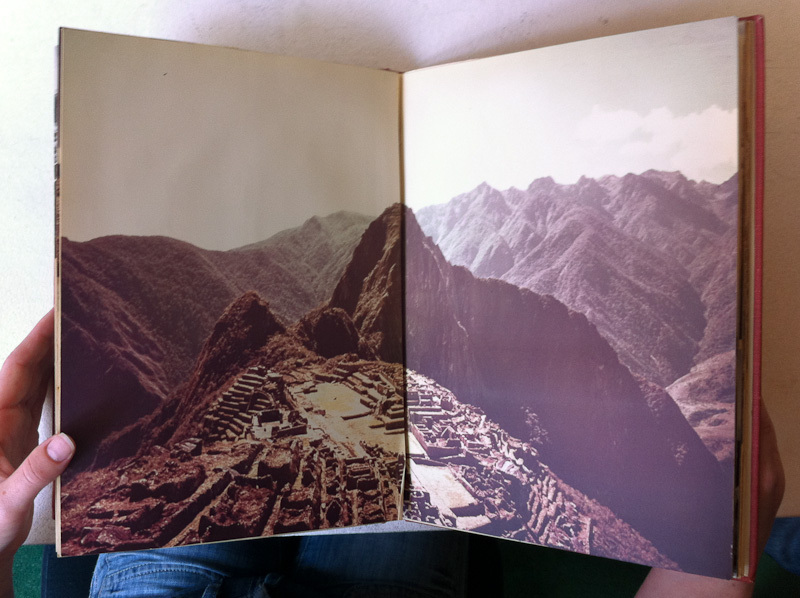 The scénographie of Foto/Gráfica is particularly good, the best I have seen for a photobook exhibition. Firstly, in order to tackle the issue of displaying more than one spread from each book, the organizers have decided to go down the road of sacrifice and cut the books up so that a series of spreads can be displayed (there are clearly enough copies of these books to spare, as book-surgery is not the kind of thing that could be done with an exhibition of rare Japanese photobooks for example). The books are displayed in a variety of different ways, from 'classic' glass display cases, to superimposed custom shelving units hanging on the walls. The exhibition also makes good use of prints, which are exhibited alongside the books and are a useful reminder of how different these media are. In the downstairs space, the central wall has been covered with scans of the spreads from a single book with a handful of prints displayed in mounts floating on the surface, a very impressive display. I'm posting a few of the official installation views with this post, as my crappy iPhone shots would not do the exhibition justice. By deconstructing the books in these different ways, it makes the viewer think about the form of the book and its specific qualities. The success of Foto/Gráfica is that it opens itself out beyond Latin American photography to engage with Latin American artistic culture more broadly. By giving politics, literature and other art forms center stage, the exhibition not only provides some much-needed context, but opens up a number of interesting paths of inquiry. Photobook lovers won't need my encouragement to go and see this, but this is one for those that are not book geeks as well. After Paris, the exhibition is travelling to Ivory Press in Madrid, Aperture in New York and to the Museo del Libro y de la Lengua in Buenos-Aires. Foto/Gráfica, Une nouvelle histoire des livres de photographie latino-américains, Le Bal, 20 January – 8 April 2012. I spend quite a bit of time with photobooks, whether it be for this blog, it's slightly less wordy Tumblr cousin, or just for my personal pleasure, but it is not often that I get to spend a day with a book like this one. In fact, it is not a book but a maquette for a book that was never published. 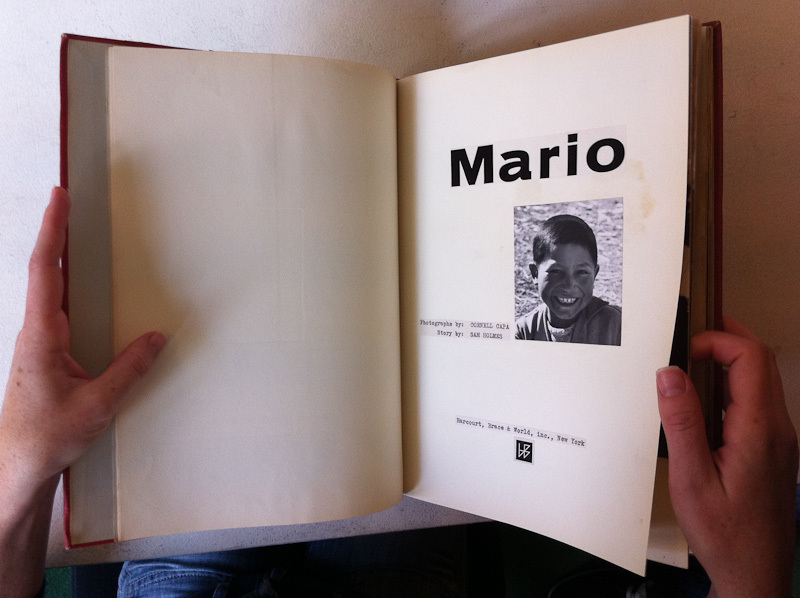 Entitled Mario, it is a children's photobook by Cornell Capa that tells the story of a young Peruvian boy named Mario. I'm not sure why it was never published but I understand that this maquette spent most of it's life sitting on a shelf and that it has only recently resurfaced. So when I was given the opportunity to borrow the book for a day, I jumped at the opportunity. Cornell Capa is probably best known for founding the International Center of Photography in New York in 1974 and perhaps also for being Robert Capa's younger brother, but he was also a photographer and a member of Magnum Photos in his own right. His approach to photography was articulated in his 1968 book, The Concerned Photographer, which he described as a book of "images in which genuine human feeling predominates over commercial cynicism or disinterested formalism". Mario is very much in line with this philosophy. The book is made up of approximately 60 images by Cornell Capa. The photographs are predominantly black-and-white although it also includes a handful of colour images. 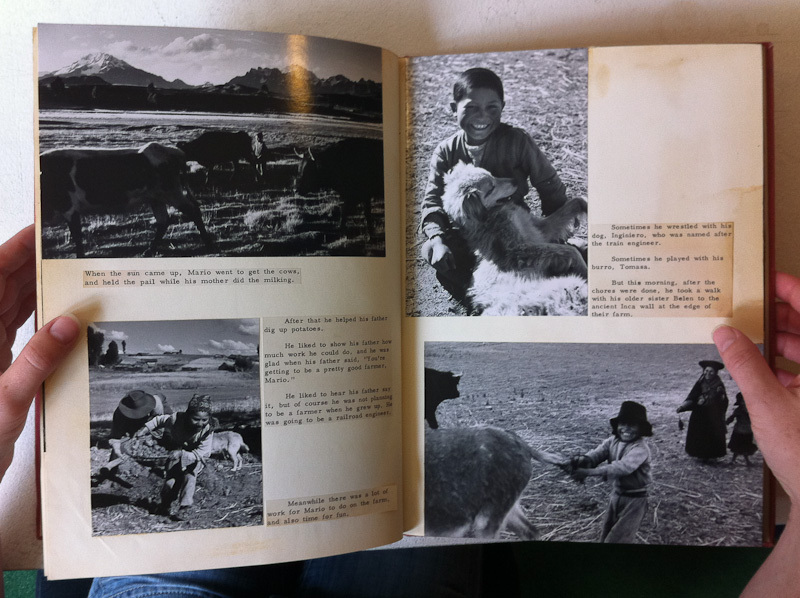 The photographs are accompanied by a narrative written by Sam Holmes which follows a Quechuan Indian boy named Mario who dreams of going to America where he will buy a tractor for his father. The story follows Mario from his family's simple life on the farm to his school and then on to the city of Cuzco in southeastern Peru for the Corpus Christi Festival, ending with Mario returning home. 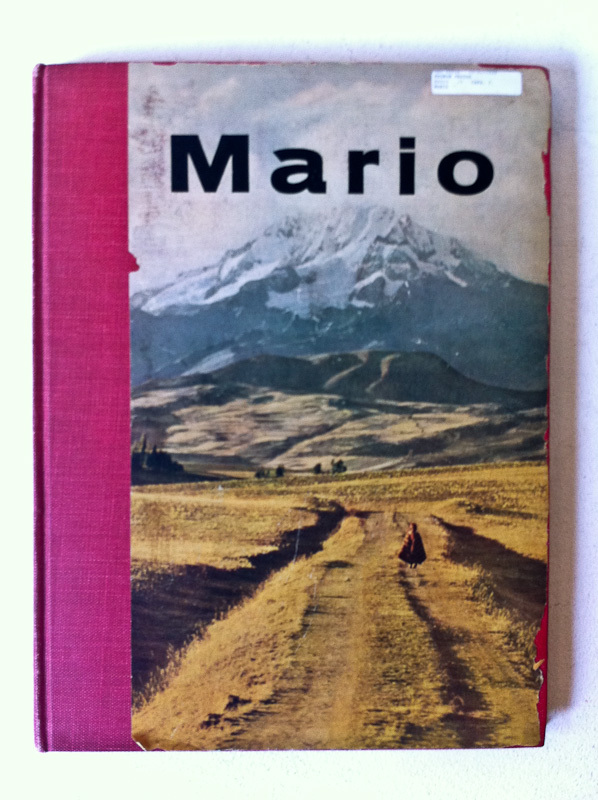 When in Cuzco, Mario happens to meet an American boy who is about the same age as him, his first encounter with the country he has been dreaming of visiting. Although the text is clearly aimed at children, there are also some quite dense historical passages. One section deals with the richness of the ancient Inca civilization while another describes the rituals of the Corpus Christi festival. One of the most fascinating things about Mario, is that beneath the childlike language, the book has a strong political message. Returning home after his encounter with the young American during which he experiences some of the comforts of the Western consumerist lifestyle after sleeping over with his family in a hotel in Cuzco, Mario grows to appreciate the simple, ancient beauty and traditions of the rural land where he is from and his urge to travel to the city or to America fades. Today's right-wing American cable news networks would be outraged by the book's progressive, 'socialist' message. I'm not sure exactly when the maquette for Mario was made (my guess would be in the late 1950s or 1960s), but it is an extremely interesting window onto American politics at the time and to the forthcoming interventionist American foreign policy of the 1970s. Although it is aimed at children, the book is essentially a progressive political tract... you could even go so far as to call it political propaganda. The maquette is an interesting insight into the photobook-making process of the pre-digital era. The design is done by using a set of prints made specifically for the layout which are then stuck into the pages of the dummy book. The text is laid out in the same fashion. The design is pretty dynamic: the book doesn't follow a 'one-page-per-picture' format but plays with different formats and layouts for the images. Having spent most of its life on a shelf, the prints are in excellent condition, even those in colour. As an added bonus, I have featured more images of Mario than usual as this is not a book that you are likely to be able to get your hands on. What makes this maquette particularly exciting is that I believe that, aside from the odd exhibition catalogue, Capa did not publish any photobooks of his work. With Horacio Fernandez's The Latin American Photobook coming out next week and Parr & Badger's The Photobook: A History Vol. 3 — with a chapter devoted to 'propaganda' — currently in the making, Mario is a timely (re)discovery. Book of the Week #5: Mexico, D.F. I have been hearing a fair amount of whispering of late about Martin Parr's forthcoming project on Latin American photobooks, which will, "with one book, completely re-evaluate how people think about Latin America". Whether it can live up to these lofty ambitions remains to be seen, but with Parr in the driving seat, there is no doubt that we can expect to see an explosion of interest in Latin American photography next year. So in an attempt to stay ahead of the curve, I'm featuring this 2004 book on Mexican photography, Mexico D.F. The book is about the city of Mexico and doesn't stick strictly Mexican photography (Jean-Marc Bustamente and Miguel Rio Branco are amongst the guest appearances). It covers a lot of ground and the quality of the work included is uneven, but for me, aside from the better known photographers like Iturbide or Metinides, the book's strength are its hidden gems, like Romero's cut-out cast of characters. Like all of Toluca's books, the design is impeccable, but I would have liked to have more resources beyond a 2-line bio for each photographer. If you're looking for an introduction to one of the big photographic nations of Latin America, you could do a lot worse... for the moment anyhow. Mexico, D.F. with work by Ivan Alechine, Mauricio Alejo, Mario Bellatin, Jean-Marc Bustamente, Antonio Caballero, Miguel Calderón, M. A. Cruz, Milagros de la Torre, Héctor García, Maya Goded, Dominique Gonzalez-Foerster, Lourdes Grobet, Graciela Iturbide, Toni Kuhn, David Levinthal, Leo Matiz, Pablo Ortiz Monasterio, Enrique Metinides, Arturo Ortega, Miguel Rio Branco, Santiago Sierra, José Trinidad Romero, Paris: Toluca Project (Hardcover, 256 pages, B&W and colour plates, text in French and English). Update: Book of the week is moving to eyecurious books etc. Look out for new picks there! I created the eyecurious blog in 2009 and ran it until 2013. You can access a full archive of the blog here.